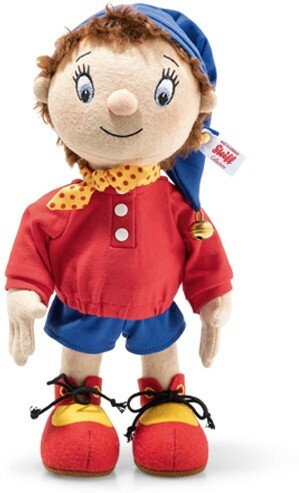 Noddy was created by the famous children's author Enid Blyton and now Steiff have created their very first Noddy to commemorate the 70th birthday of the very first Noddy book in 1949, called Noddy Goes To Toyland. Noddy has been the star of television shows on British TV since 1955 and still continue to this day. Noddy lives in Toyland, with all of his friends, including Big Ears, Tessie Bear and Bumpy Dog and he is known for driving around in his famous yellow and red taxi, that makes a distinctive "Parp, Parp" sound when he blows the horn. This extra special 70th Birthday Noddy is made from the finest woolfelt and Steiff have captured him perfectly - from his big wide-eyed embriodered eyes, big smile and big feet, to his distinctive outfit, comprising of a red top, blue shorts, yellow and red spotted neckerchief and the famous blue hat, complete with jingling bell!! Noddy is kind-hearted, honest and loveable and he has been a popular character in families for generations, with stories being read and enjoyed by all. This Steiff Noddy will help to keep your memories alive .....so........"MAKE WAY FOR NODDY"..........in your collection!! He has the famous gold "Button in Ear" and a white label, showing that he is only limited to 1949 pieces worldwide, making it very collectable.